These team members often occupy a great deal of a leader’s time – either directly or even in their mind. How can I get them to be more engaged? How can I deal with this under performance? How can I broker a positive outcome? The risk of paying attention to the ‘squeaky wheel’ – is that the solid and excellent performers are often left alone. It is so much easier leading a team of highly skilled, highly motivated and engaged team members who deliver!! It makes it easier for leaders to get on with their jobs! But what is the role of a leader? Yes, we often have our own tasks and deliverables – and dealing with issues in our team can make it hard to get those things done. But fundamentally, checking in with each team member IS the ROLE of the TEAM LEADER! It is not an extra part of your job. Giving time to team members, especially the ones that are performing, is vital! If you don’t, you are risking them moving on. As Dr Travis Bradberry writes, “It’s pretty incredible how often you hear managers complaining about their best employees leaving, and they really do have something to complain about—few things are as costly and disruptive as good people walking out the door. 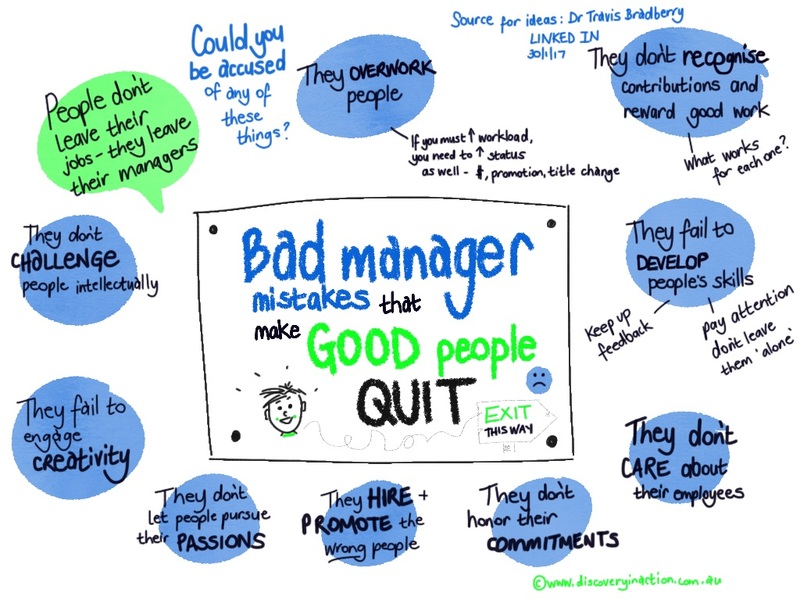 In this LinkedIn Post, Bradberry shares 9 bad manager mistakes that make GOOD people quit. We’ve made a simple visual of these 9 things. Set aside 10 minutes today to reflect on these statements. Think of each member of your team – ALL of them. Could you be accused of any of these things? What is one thing you could do for each person – especially the ‘GOOD ones’ to help make sure they keep delivering? ← How the ‘Power Pose’ can help you be more confident!